The Seville Alcázar is one of Andalucia’s gems, a beautiful architectural masterpiece whose history tells the story of Seville. Originally a Moorish fort (the name comes from the Arabic for palace) the Alcázar is one of the finest remaining examples of predominantly Mudéjar architecture in the country; but that only begins to tell the tale. This seemingly exquisitely designed palace (still officially designated as an official royal residence) has, in fact, been added to continuously over the years. It was at the beginning of the 10th Century that the original building was started but during the following century the ruling Almohades began to fully develop their royal fortress – on the western side of the current site. Following the reconquest, successive kings augmented the buildings but the predominant figure in this part of the Alcázar’s history was the controversial Pedro I, who added, amongst other things, the mighty Palacio de Don Pedro. Pedro employed mainly Moorish and Jewish workers brought from Granada and incorporated huge fragments of buildings from Córdoba, Valencia and the nearby ruined city of Itálica into the constructions. The buildings, and especially the wonderful gardens incorporated into the Palace, were developed all the way to the 19th Century. Indeed, the gardens near the Amohad Wall on the eastern side of the complex are a 20th Century addition. The fascinating thing, however, is that – with this profusion of Mundéjar, Gothic, Renaissance and Baroque styles – the Alcázar has such a wonderful feeling of unity about it. There are so many aspects about this palace to fascinate and intrigue visitors – both inside the rooms, in the patios and the wonderful gardens. Perhaps the most spectacular and luxurious of the rooms are the Cuarto Real Alto and the Salón de Embajadores. The former is the suite of rooms used by the Spanish Royal family, although usually open to the public, and is as extravagently decorated as you might expect. The Salón de Embajadores was originally the throne room of Pedro I and has sumptuously tiled walls and a ceiling with a magnificent cedarwood cupola, with elaborate star patterns. 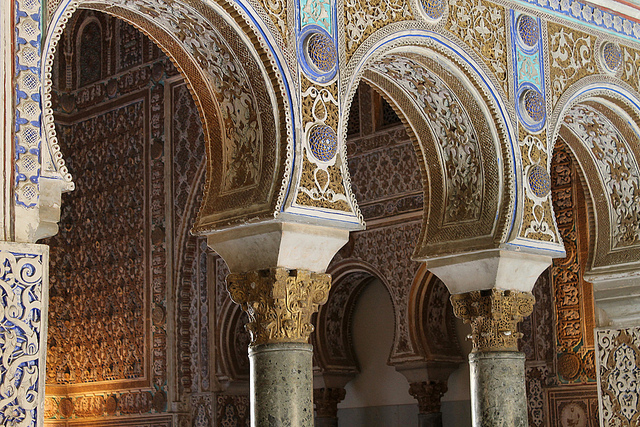 It has a particularly spectacular archway, Arco de Pavones, covered with motifs of peacocks. This room is part of Pedro I’s incredible fusion of Muslim and Iberian styles – the Palacio de Don Pedro. You’ll especially notice the Patio de las Doncellas, the Courtyard of the Maidens, commemorating the annual demand by the Moors of 100 virgins from their Christian kingdoms. This is as astonishingly beautiful as anything in the Alhambra – containing a large reflective pool, with sunken gardens on either side, exquisitely shaped arches, and spectacular wooden doors. The irony of this beauty being the creation of a ruler who murdered many of his own family in order to keep his position will add more poignancy to the occasion. 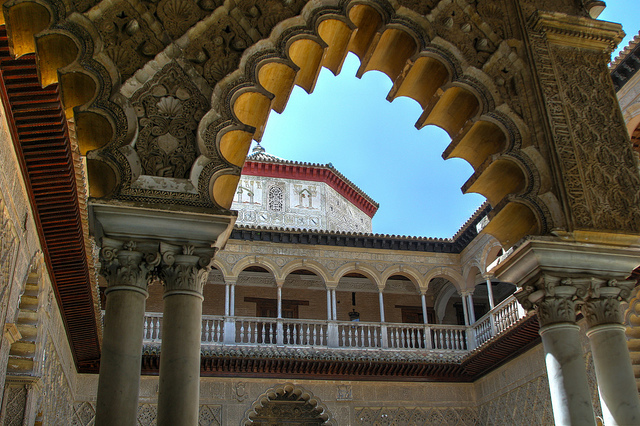 The upper storey was added later by Carlos V and mixes Italian Renaissance and Mudéjar styles. Go from there into the adjoining Cámara Regia, with its mix of plaster and tilework, and you’ll fully understand why people become so enchanted by the atmosphere of the Alcázar. There are many other compelling attractions. The Sala de Audiencias, for example, has the first known painting of Columbus’ American discoveries. The Casa de Contratación includes the chapel in which Columbus reported back to Ferdinand and Isabella after his second journey. You’ll also see many references to Doña Maria de Padilla – her bedrooms, her patio, her bathing waters. Now a symbol of purity to the people of Seville, this former mistress of Pedro I, who apparently loved her to distraction, had a fascinating life story. No reference to the Alcázar would be complete, though, without reference to the delightful gardens. Andalucía has many beautiful gardens – notably at Granada and Cordoba, of course – but those of Seville lose little in comparison with any of them. Even on the hottest summer’s day – and they do get hot in Seville – the gentle elegance and grace of the gardens, with their delicate water features, meticulous planting and cunning use of light and shade, will be soothing and restorative. There is so much more that could be said about the Alcázar of Seville. Just the other side of Plaza del Triunfo from the mighty Cathedral, the main entrance for visitors is through the Puerta del León. No matter how brief your stay in the city, don’t miss it.